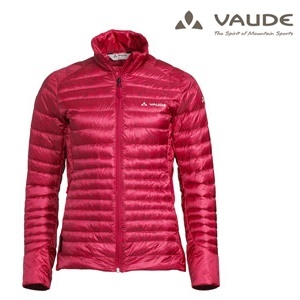 VAUDE only use recycled down in the highly technical Mountain line in the future. 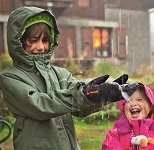 The Kabru Hooded Jacket, Kabru Light Jacket and Kabru Light Vest have been specially designed for mountain sports enthusiasts and alpinists whose focus is on sustainability as well as small pack size and optimum performance. The down trio is light as a feather, yet keeps you warm and cozy, and can be packed down small. The Light Jacket weighs in at almost 100 grams less than the Hooded Jacket, and the Kabru Light Vest can be quickly pulled out of a backpack if you need extra warmth on tour. All three models are equipped with a high-quality, GRS-certified, 80/20 down feather blend (700 cuin), and a super-light, yet stable Pertex® Quantum outer shell made of recycled polyamide. The side torso sections and sleeve cuffs are made of moisture-resistant PrimaLoft® Silver Insulation Eco – which is also made from 100 % recycled PET bottles. The outer material and lining of the Kabru Hooded Jacket, Light Jacket and Light Vest are all made of recycled polyamide, reducing waste and conserving resources. The only component that VAUDE hasn’t yet been able to find a recycled solution for is the zip.